OVER THE LAST 7 YEARS, ALRP HAS EXPERIENCED A 45% INCREASE IN THE NUMBER OF PEOPLE COMING TO US FOR LEGAL HELP. Additionally, foundation and corporatefunding for ALRP’s free legal services for people with HIV/AIDS is way down this year. ALRP is counting on individual donors like YOU to help us make up this funding shortfall, so we can keep our legal services available for our clients this year. All ALRP LEGAL EAGLE Team Members receive a FREE ALRP Coffee Mug! To REGISTER for AIDS WALK online, visit www.aidswalk.net/sanfran and find your law firm or ALRP Legal Eagles team page and sign up. It’s that easy! If you can’t join our team, please consider making a donation to the ALRP Legal Eagles. 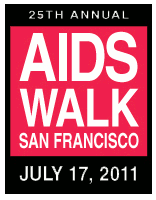 If you have questions or need AIDS Walk team registration or donation assistance, contact ALRP team captain Jim McBride at jim@alrp.org or (415) 701-1200 ext. 301.